This is just a great idea — a double-whammy of a lesson for the readers/audience. 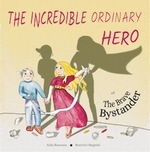 First, there’s a discussion of what it means to be a hero (doing things that are heroic) and there’s a little first aid lesson — age appropriate, mind you — to help parents/teachers train up young ones. The writing was good enough — I think it could’ve been written in such a way to connect with readers better, and to be a little less preachy. But my guess is that the audience will have no problem with it, just the adults. I did think things ended abruptly, though — and that’s going to rankle a kid or three. Still, this is solidly-written. The art will keep the reader’s attention — and honestly, it could’ve gone pretty graphic, but it didn’t. From Rascanu’s website, it appears that this is supposed to be the beginning of a series — it would probably work better for reading if there was at least one companion volume. If so, it’d be a great investment for parents of wee ones — if not, this would still be a good idea. Just not as much of an investment, I guess. Disclaimer: I received a copy of this from the author in exchange for this post and my honest opinion.